Several of the board members expressed dismay at Wednesday's meeting over the fact funding for sports and art could be seriously reduced or eliminated. May. 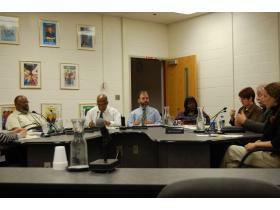 28, 2009 · 8:21 p.m.
With the July 1 deadline quickly approaching, the Ypsilanti School Board met Wednesday night to further discuss possible cuts to the 2009-2010 budget. If the school district does not have a balanced budget in place by the end of next month, they will be obligated to file a deficit elimination plan with the state. Superintendent James Hawkins delivered an updated budget report to the board, showing the district faces a projected deficit of approximately $1.4 million. The initial shortfall was estimated at $4 million, however, the district has planned for multiple cuts. As for personnel cuts, the budget calls for eliminating two custodial positions, cutting 10.5 regular teaching positions in addition to five total positions out of the art, music and physical education departments. John Fulton, director of human resources, said four of the teacher cuts would come from the middle schools, two or three would come from the high school and two or three would come from the elementary schools. The district would also eliminate one of its police liaison officers and reduce hours for clerical and other support staff. Additionally, the district would eliminate all middle school sports, funds for new library books, piano classes at Ypsilanti High School and band and choir field trips. The $1.4 million estimate is also contingent upon the successful completion of the sale of Fletcher Elementary School and potential offset from the use of federal stimulus funds. Hawkins noted the district must be careful when it uses stimulus money, as it is not allowed to use the funds for items normally found in the general operating budget. Several of the board members expressed dismay over the fact funding for sports and art could be seriously reduced or eliminated. Trustee Kira Berman said that achievement increases when school increase funding for the arts. “We’ll be meeting here a year from now with a spreadsheet saying ‘here’s our deficit this year,’” he added.